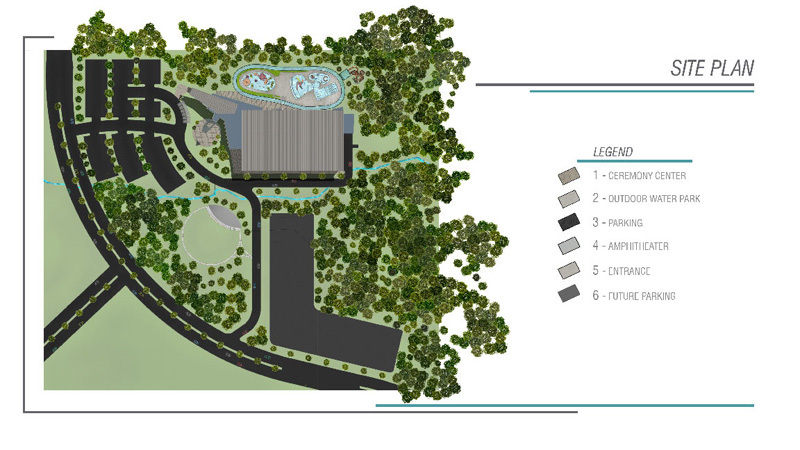 The Kensley Grace Aquatic Center will be a world-class, family-focused competitive aquatic facility. The center will effect the health of any citizen seeking the fitness benefits of water activities. 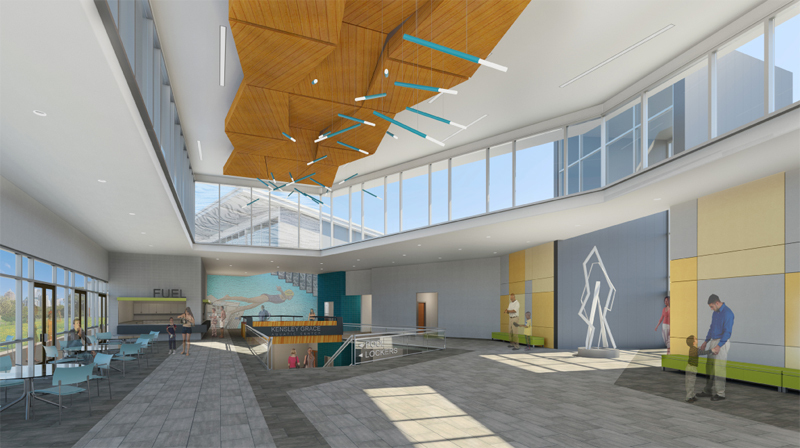 From young kids learning to doggy paddle to older seniors participating in water aerobics and other low-impact exercises, the Kensley Grace Aquatic Center will touch the lives of thousands of residents. Architectural renderings can be found at the bottom of this page. 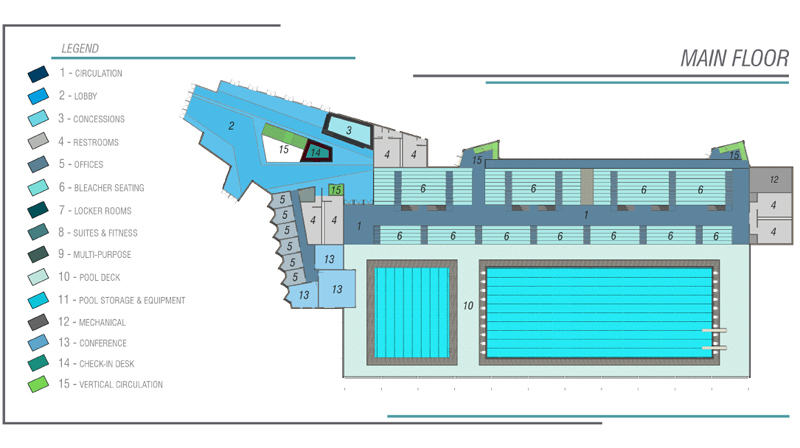 The main pool will be a 12 lane 50 meter long by 25 yards wide with moveable bulkheads allowing the pool to be divided in three 25 yards pools or as a single 50 meter pool. The building will feature stadium seating, scoreboards, generous deck space and locker rooms. The pool will be open year round. 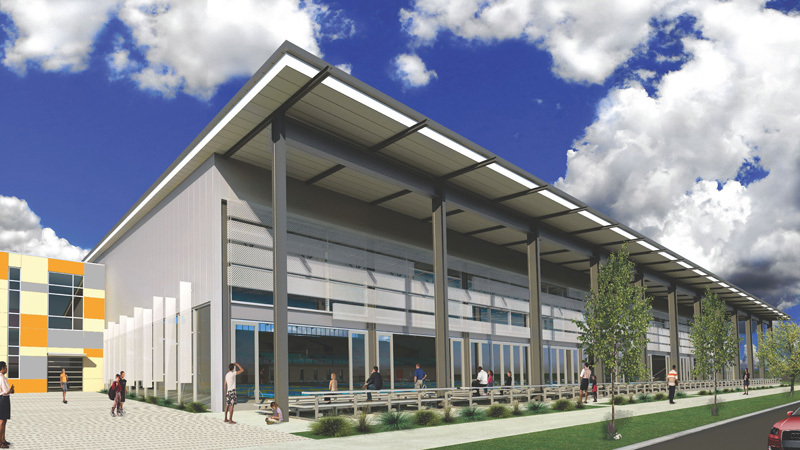 This versatility will allow The Kensley Grace Aquatic Center to host a wide array of swim meets including recreational leagues, school competitions, collegiate, national and Olympic caliber meets. The therapy and training pool will be 25 yards long by 15 yards wide. 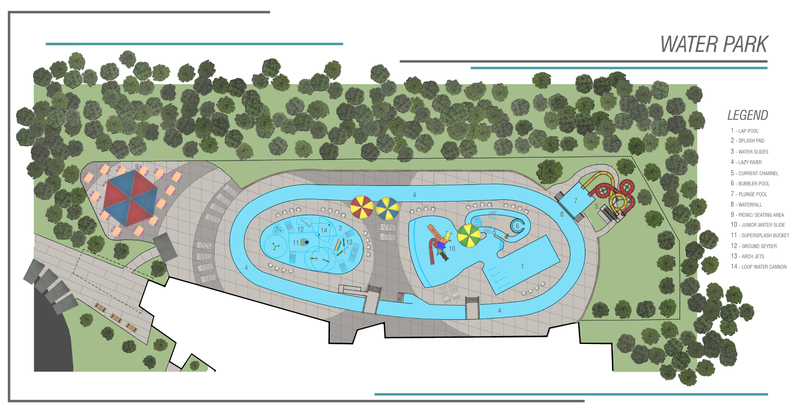 The pool will feature swim lanes, an ADA compliant entry ramp with hand rails and round area with underwater benches for educational purposes and relaxing. This year-round indoor pool will be maintained at a temperature of 85 degrees. As the name of this pool states, it will be used for therapy and training. In addition to the entry ramp their will also be a lift available for challenged swimmers. The pool will be used for a wide range of programmed activities. These activities range from entry-level swim lessons to low-impact rehabilitation therapy for recovering patients. This pool will be a huge benefit to citizens of Henry County. 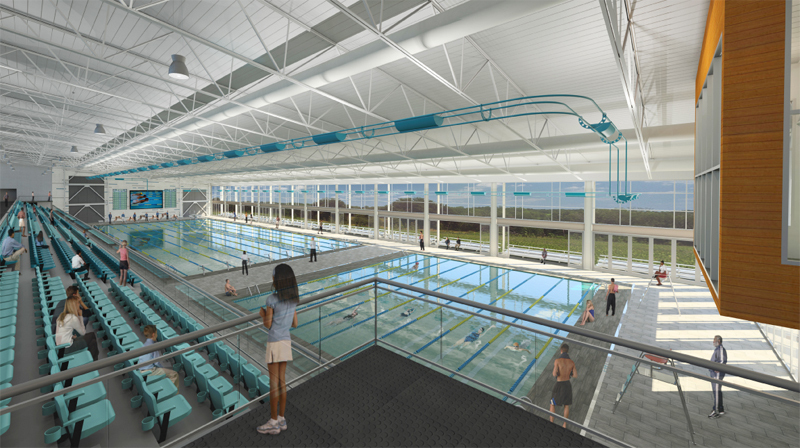 In addition, the pool will be used for warming up and cooling down during large swim meets hosted in the Main Pool. The family pool will be located outside. It will be open from May to September. This pool will feature a zero entry splash pool that connects to a play pool and a 25-yard lap pool section. This pool will be surrounded by ample seating and family pavilions. The family pavilions will be and ideal location for group swim events and birthday parties. 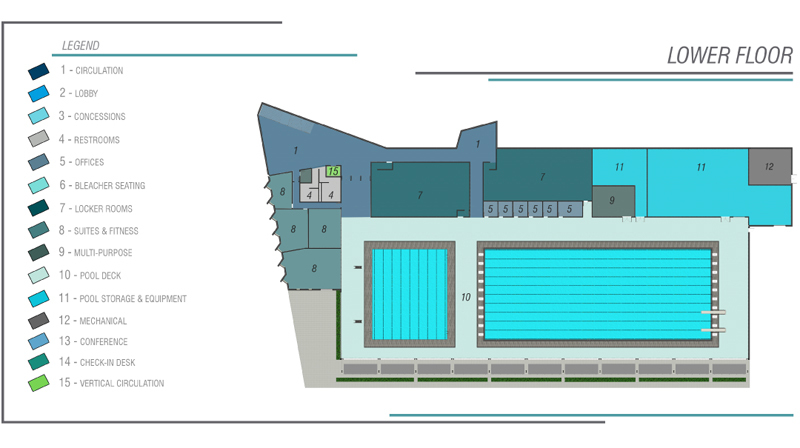 The family pool reinforces the Aquatic Center’s goal of being family-focused. 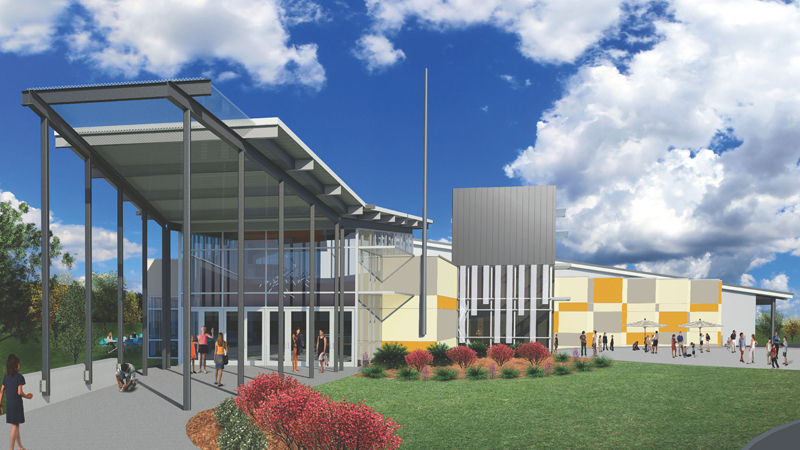 The center will have a centrally located snack bar, exercise rooms, training rooms and a beautiful entrance.